On Yom Kippur, there is one story from Israel and Palestine: the killing of 18-year-old Hadeel Hashlamoun at a Hebron checkpoint after she was confronted by soldiers pointing guns. Youth Against Settlements says, “She tried to leave” before she was shot. Israeli government claims that the soldiers believed she was going to pull a knife. If he is a medical professional, he takes no interest in the Palestinian woman’s situation except to gawk. That organization provides emergency medical services to the settlers. Presumably only to Jews. Another settler grins at the scene at 1:38. Toward the end of the video you can see the Palestinian community of Hebron, caged inside the checkpoint. Wattan TV reported that the young woman was left to bleed for more than 30 minutes. Here is a photo of Hashlamoun’s funeral, today, posted by NasserZB. A researcher for Amnesty, Jacob Burns, has posted this photograph of a knife he says the Israelis claim Hashlamoun was carrying when she was killed. He notes, of course, that even if she were trying to attack soldiers, they would not be justified in firing. The New York Times report is that the soldiers were not at risk. [A] European activist, who spoke on the condition of anonymity because his employers do not permit him to talk to reporters, provided photographs of the episode. 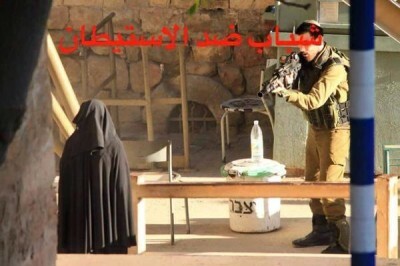 One showed a soldier pointing his weapon at Ms. Hashlamoun, and another showed her lying on the ground. The activist said three or four other soldiers had raced to the scene and also fired. Another witness, Fawaz Abu Aisheh, 34, who appeared in the photographs taken by the activist, said Ms. Hashlamoun did not respond as soldiers screamed at her in Hebrew to step back. A soldier shot at her feet twice, but she did not move, he said. Mr. Abu Aisheh said he had opened a small gate inside the checkpoint so that she could back away from the soldiers. She did so, creating more distance between her and the soldiers. A shame that the New York Times does not include Hashlamoun’s picture in that article. The Times does include a photo of Palestinian women mourning at the funeral of the other Palestinian killed in the West Bank. al Jazeera’s account says that Hashlamoun was left bleeding on the ground and that the killing has fostered clashes across the occupied city. However, a video posted by the news agency PalMedia shows the woman being left to bleed on the ground after she was shot and then being roughly pulled out of the frame of a camera. “Now the soldiers have increased their numbers throughout the city,” said Amro, who is the coordinator of the Hebron-based Youth Against Settlements monitoring group. According to Amro, clashes broke out between Palestinian youth and Israeli soldiers in the area following the shooting and “are still ongoing across the city”. Thanks to Dena Shunra, Ofer Neiman, and James North.